Julieta Gaztañaga (Bahia Blanca, Argentina 1977) is an anthropologist. She had no reference through her family of her Basque background, beyond the verification of that fact, which her own last name proved, with some people having difficulty in pronouncing it. But carrying the last name did not bring along with it the content or knowledge about the culture, so Julieta tried to acquire it by jumping into the Euskaltegi Euskaltzaleak in Buenos Aires. 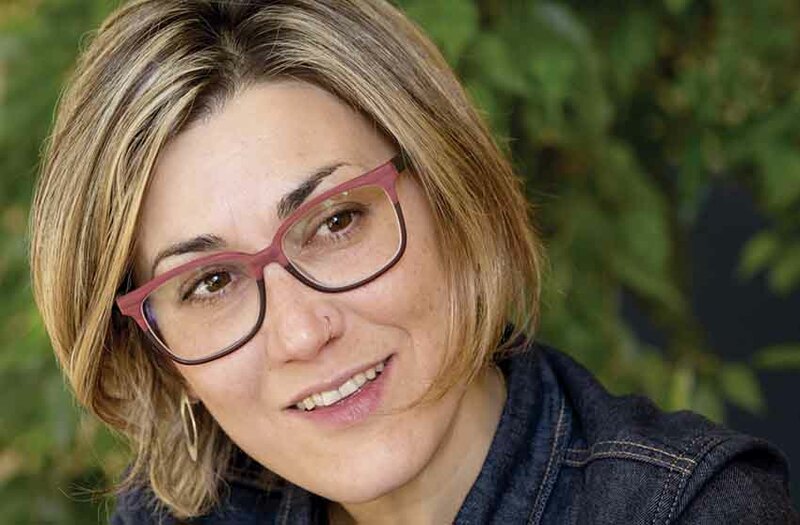 Danele Sarriugarte interviewed her in Argia. Danele Sarriugarte. Julieta is an anthropologist who studied at the University of Buenos Aires and there she worked as a researcher and professor over the last 20 years. She researched the political work and militancy of Peronism and is currently engaged in researching the Gure Esku Dago movement, which advocates the attainment and exercise in Euskal Herria of the right to be able to decide its destiny. Julieta Gaztañaga is currently in Euskadi, since September, for a field work that will last through the beginning of March. …You have also worked in Argentina on questions related to the Basque Diaspora. Something that seems logical after learning your last name, but this interest didn’t come from home right? I have a unique last name and in Argentina they always write it incorrectly. It isn’t a complicated last name but it seems to cause confusion, they write it in every way, but the correct one. So my motivation came from my confusing name and our father telling us it was Basque, but that’s it, he didn’t explain anything else. He never took us to a Basque club because he doesn’t believe in those kinds of things. Being young I was aware of the Basque world, through friends, and later I started studying Basque because I was interested linguistically and anthropologically in the language. Where did you study Basque? At the Euskaltegi Euskaltzaleak in Buenos Aires. Euskaltzaleak is really a Basque club, but not a folkloric one. It is special because of its character as a Euskaltegi and because at its heart the love for Basque is very linked to the love of Euskera, and in a political sense. That is why it occurred to me that maybe it could become a new anthropological field of research for me. Because of Peronism, despite being something completely different, it had the political value in common with Euskaltzaleak, its commitment, this militant character…That is how I started researching what is referred to us as the abertzale left in the Diaspora. How did Euskaltzaleak come about and what kind of people usually gather? Euskaltzaleak was born in the heart of the referential Basque club in Argentina, Laurak Bat in Buenos Aires. It is the oldest club in the world and celebrated its 140th birthday in 2017. Euskaltzaleak was an independent institution from its beginning and some five years ago, it established its own separate headquarters. Euskaltzaleak is very plural from the point of view of gender and the social character and gathers people with many different political opinions. Despite generic support to the Abertzale Left from here [the Basque Country], its members, as Argentines, take very different positions among themselves, and the result is very interesting because many ideologies converge at its heart. By giving great importance to the Basque language, teaching Basque, it also integrates people without any Basque background, but who comes because of their interest in the language. You began your research on Gure Esku Dago (GED) in Buenos Aires. Yes, I saw the documentary Gazta zati bat at the Euskaltegi and I was impressed, it reminded me of my thesis on politics despite the comparison being a little risky and very generic. That artisan way of doing politics, person to person…was familiar to me. Then I began to read about it and at that moment members of the GED participated in events taking place throughout the Diaspora and it seemed to me that it was a topic worthy of being researched. The Basque Diaspora in Argentina includes people from the entire political spectrum, from the right to the left. I found that unity curious, because when it comes to Argentine questions they discuss each and every issue. Why do you think it happens? Personally, it is my impression, I would say that everyone is in favor because there is still no binding vote. I would like to know what would happen, for example, if a consultation was held on auto determination. But in any case, I still find it very significant, and for that reason I would like to emphasize that nobody has opposed, or at least nobody has publicly shown their opposition. This is so significant to me, this support diffused as if no one is against it. Here, for example there has been opposition….